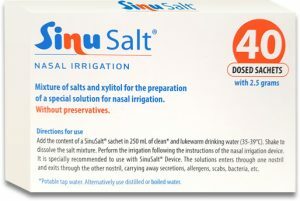 SinuSalt® is a device designed in order to do the nasal irrigation in. Reduce the use of antibiotics and nasal descongestants with SinuSalt®. Device for performing nasal irrigation both quickly & comfortably. Mixture of several salts plus Xylitol specially formulated for nasal irrigation. Nasal irrigation is the introduction of a saline solution through a nostril, allowing the liquid to make a complete tour through the nasal and paranasal sinuses until it gets out through the opposite nostril. 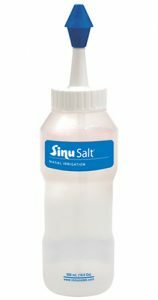 SinuSalt® is a device designed in order to do the nasal irrigation in an easy, comfortable and simple way. It doesn't need any kind of power supply or electricity and allows to wash the sinuses efficiently.